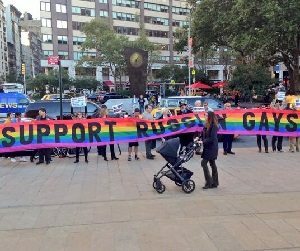 A protest against Russia’s anti-gay laws disrupted the Metropolitan Opera’s opening night gala in New York City last night. Before the gala, an online petition urging the Met to dedicate the performance to gay rights in Russia had attracted more than 9,000 signatures. The petition, started by gay composer Andrew Rudin, noted that Tchaikovsky’s work was being performed by artists who supported a Russian Government that had passed anti-gay laws. Peter Gelb, the general manager of the Met Opera, wrote an opinion piece for Bloomberg News over the weekend however, which stated that while he and other members of the opera company were personally opposed to the “tyranny” of Russia’s anti-gay laws, it would not be appropriate to associate the opera’s performance with political causes. The performance of Tchaikovsky’s Eugene Onegin comes a week after Russia’s culture minister denied that the world-renowned composer was gay, saying there was “no evidence” of his homosexuality. Vladimir Putin signed the controversial anti-gay legislation into law in June. Under the terms of the law, the “propaganda of non-traditional sexual relations towards minors” will be punishable by large fines, or imprisonment.